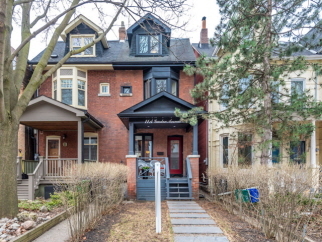 Interior Features Classic Victorian Roncesvalles home, 4 fully renovated levles, with modern designer finishes, gorgeous & energy efficient, re-built from the studs in 2015. Entertainer's kitchen with open concept main floor full of charm & character. Hatoba natural wood flooring throughout 3 levels. Featuring high ceilings, crown molding, wide baseboards, pretty lighting & led pot-lights, and practical built-in cabinetry tucked under staircase. Exterior Features Solid brick century home, inviting front entrance with covered porch, landscaping surrounding the house including recently added patio stone patio overlooking backyard. Two parking spots, with access from rear lane, and fenced gate for backyard privacy. Additional Features and Amenities See virtual tour for pictures & property details. Come to the open house or book an appointment for your private viewing. Must be seen.